At Doctor Valve, I offer my clients unparalleled craftsmanship and attention to detail for repairs and restorations, design consultation, and R & D (research and development) projects. My shop is equipped with the same type of tooling and machinery that was available to me during my long tenure at Schilke. This enables me to give your trumpet, cornet, or flugelhorn the world-class service that it deserves and you expect. All surface restoration, repairs, honing, plating prep work, assembly, and finishing are performed on site at the Doctor Valve shop. The only outsourced work is the actual plating or lacquering, and I use the best in the business. Like many premier manufacturers and service technicians, all my plating is done by Anderson Silver Plating in Elkhart, Indiana. My lacquering is done by Charlie Melk of Charlie's Brass Works in West Allis, Wisconsin. Attention to detail and customer satisfaction are my primary goals. or call 1.708.482.8153 to schedule an appointment for your horn. The Paypal payment form is at the bottom of this page. Click "description" to jump directly to that section of this page. A Valve Overhaul is also known as a "Valve Job." Some instruments will require a chem-clean with a valve overhaul. Services such as dent removal, slide repair, custom ring or saddle fabrication, tube replacement, lead pipe mounting, trigger installations, amado water key conversions, and other custom tweaks are billed at the shop rate of $100/hr. Note: Prices do not include shipping costs, which vary based on services performed. The cost of the gold used with any gold plating services is subject to market fluctuations. A Doctor Valve valve overhaul (aka "valve job") is a procedure that restores the fit of the valves to "like new," or often "better than new" condition. It begins with a play test of the horn (when playable) so that I have a baseline for that particular horn. During this process, I make notes about any playing anomalies and well as the overall characteristics of the sound and blowing feel. Next, the horn is disassembled, measured. and visually inspected. Some instruments will require a chem-clean, which will be done at this point. The casings are lightly honed to check for any serious washouts or other problems. The valves and casing are then precisely measured to determine the necessary amount of plating build-up. The valves are trued and sized on the hone in preparation for plating. Next, with a "Shielded Port" valve overhaul, the valve ports are then precisely shielded, so that the windways in the valves retain their exact original size. With an "Unshielded Port" overhaul, this step is not executed. Other than this one difference, the Shielded and Unshielded port overhauls are identical. After another cleaning, the valves are carefully packed, and sent to Anderson's. There they are built up with hard nickel plating. Upon return from the platers, the valves are honed to a size slightly above the casing dimension, then the casings are carefully honed to the point where the valves have the exact proper fit. The horn and parts are then ultrasonically cleaned, and the instrument is reassembled with new valve pads and felts, valve springs, and waterkey corks. It is then tested to assure proper playing function and playing characteristics. Any final tweaks are made and plated instruments are then given a complete polish job using 3M Tarni-shield polish. The finished horn is now ready for return shipping or customer pick-up. A special note about NY Bachs and instruments of "extreme age" or with severely damaged valves: In some of these cases, it is necessary to do a two-step valve build-up process. This entails more work, and two trips to the platers. I only do this when the required build-up is too great to do in a single nickel plating step. NY Bach valves were chrome plated at the factory, and in order to achieve good results, this chrome has to be completely removed from the outer valve surfaces prior to the build-up. On some NY horns, I have been able to do the valves with a one-step plating build-up (the usual method). On the other hand, some of these instruments do require a two-step plating process, because once the chrome is removed, the valves require a bigger build than is advisable in just nickel. In these cases, the valves get a first round build in copper, are re-honed and trued, re-shielded, and then sent to Anderson's a second time for the final nickel plating. The rate for a valve overhaul is $545 for most 3 valve instruments (add $180 for a 4 valve horn). If a chem-clean is required, it is done at the discounted rate of $125. If the two-step plating process is required, add $225 for an initial copper build. An Optimum Port Matching Valve Alignment is a procedure that optimizes the valve port and casing port match-up, which improves the evenness of response of the instrument. My basic approach to this is to NOT modify the existing metal parts. Most of the time, this is possible; sometimes it is not. First, the trumpet is playtested, and the existing alignment is inspected. Following this inspection, custom pads are cut, installed, and adjusted with shims to optimize the alignments of the ports in the valves with the ports in the casing. I use a variety of composition (non-felt) pads which are NOT weather sensitive and maintain correct alignment for a very long time. On many instruments, because of the way the casings and valves were drilled during manufacture, perfect alignment of all the holes is not possible. In these cases, the optimum port alignment is chosen based on my understanding of the instrument as a trumpet player and my knowledge of the physics of air flow through the instrument. If requested, your previous pads can be bagged and tagged with specific locations indicated so that you could reverse the procedure, and return to your original setup. The rate for an Optimum Port Matching Valve Alignment on most horns is $190. The instrument overhaul service is an extensive rebuilding and refinishing service for your instrument. It begins with a play test of the horn (when playable) so that I have a baseline for that particular horn. During this I make notes about any playing anomalies and well as the overall characteristics of the sound and blowing feel. I then disassemble the instrument and give it an initial ultrasonic cleaning. All parts are carefully inspected for cracks, rot, and other problems that might require part replacement or patching. Depending on the findings of my inspection, I often confer with the client at this point, to determine exactly what path they wish to follow. Sometimes it is decided that the original pieces be retained and perhaps patched over, rather than risk altering the playing characteristics with replacement parts. This is because even "identical" parts can vary slightly and can sometimes play and feel slightly different. Alternately, it may be decided to replace parts so that the instrument will look as close to new as possible when completed. If this is the case, any new parts are measured and tweaked as necessary to match up as closely as possible to the parts being replaced. This is very important because minor differences can make big playing differences, especially if you have played a horn for thirty years or so, and know the horn's characteristics totally. If the instrument was lacquered, the lacquer (or what is left of it) will be removed. Many older instruments were finished with the old nitrocellulose lacquer; most modern instruments have a baked-on epoxy lacquer. A short discussion with my take on lacquer and lacquered instruments can be found here. The next step is removal of the bell and leadpipe from the body of the instrument. All old solder is removed from the parts and horn body. All pieces are chemically cleaned to remove the lime scale and other crud from the inside surfaces. If the valves are also being overhauled, the valves are prepped and sent for plating at this time. The bell and leadpipe are straightened, minor dents are removed (major dent removal is extra), and surface pitting is carefully removed, as much as safely possible. Some pitting may remain if I feel that removing all of it would make areas of the horn overly thin. If the horn is getting any new tubes, they are now made and mounted. The body, bell and leadpipe are buffed as separate pieces ensuring total and even clean-up of the surfaces. Now the pieces of the horn are ready for reassembly. The braces are carefully adjusted to reduce tension to a minimum. This can yield significant gains in the way an instrument plays particularly in the evenness of response throughout the entire range of the instrument. 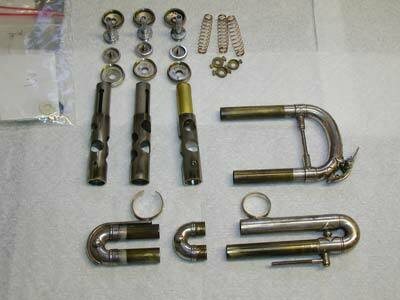 The parts are then expertly resoldered together, and the horn and parts finished buffed. Everything then gets ultrasonically cleaned to remove all buffing residue. The parts (valve slides and valve caps) are then put back on the horn and the instrument is shipped to Anderson's for plating. When the instrument returns from plating, the valve overhaul is completed, or the valves are expertly hand lapped in the casing to smooth the plating that deposits onto the inside casing surface. The horn and parts are then ultrasonically cleaned again and the horn reassembled with new pads, felts, valve springs, and waterkey springs and corks. It is then tested to assure proper playing function and playing characteristics of the "new" horn are compared to the notes made prior to the overhaul. Any final tweaks are made and the instrument is then given a complete polish job using 3M Tarni-shield polish. The finished horn is now ready for return shipping or customer pick-up. My standard trumpet overhaul charge is $1025, and covers the work required on instruments in average condition, refinished in silver plate or lacquer. Additional work, such as major dent removal, severe pitting removal, patching, or making replacement parts, is billed at my shop rate of $100/hr. The instrument replating service is sometimes an option for refinishing your instrument. It is much less involved than an overhaul and is most often used on instruments that are in very good to excellent condition. It begins with a play test so that I have a baseline for that particular horn. The horn is then disassembled and ultrasonically cleaned. If the instrument was lacquered, the lacquer (or what is left of it) will then be removed. Many older instruments were finished with the old nitrocellulose lacquer; most modern instruments have a baked-on epoxy lacquer. A short discussion with my take on lacquer and lacquered instruments can be found here. If the valves are being overhauled, then the valves are prepped and sent for plating at this time. After disassembly, (and chem-cleaning, if necessary) minor surface problems are addressed and the body of the horn and the parts are carefully buffed. Everything then gets ultrasonically cleaned again to remove all buffing residue. The slides and valve caps are then put back on the horn and the instrument is shipped to Anderson's for plating. When the instrument returns from plating, the valve overhaul is completed or the valves are expertly hand lapped in the casing to smooth the plating that deposits onto the inside casing surface. The horn and parts are then ultrasonically cleaned again, and the horn is reassembled with new pads, felts, and corks. It is then tested to assure proper playing function. Finally, it is then given a complete polish job using 3M Tarni-shield polish. The instrument is then ready for return shipping or customer pick-up. Here are some examples of where the re-plate service is an appropriate choice. A straight, undamaged instrument, perhaps with a few minor dents or other small surface imperfections where the plating is beginning to wear through but the surface has not pitted extensively. Another circumstance where this service could be used is on a fragile thin instrument that is in good shape, or had any problems addressed separately, that would benefit from having a bit more metal put on for durability and for increased mass. There are many reasons why this might not be the best choice for some instruments, so I must personally inspect the instrument before deciding that this would be an appropriate refinishing option. If the instrument requires a chem-clean, add $125.00. A trumpet should have a chemical cleaning on an regular schedule: annually if you play a lot, more often if you play in extreme conditions (salt air for instance), less often if you play only occasionally, or are very meticulous in keeping your instrument clean. 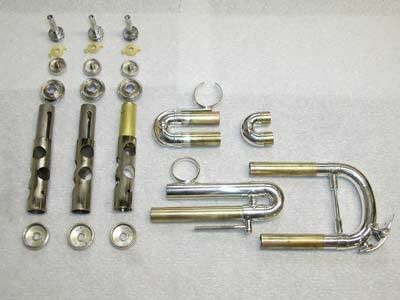 A chemical cleaning removes build-up on the inside of the instrument, and is followed by an ultrasonic cleaning and polishing (for silver, gold, or brass) and an ultrasonic cleaning and blow dry for lacquered horns. This service is included with instrument overhauls and full restorations. A stand-alone Chem Clean is $140.00 for lacquered instruments and $175 for plated or raw brass; with a valve job or refinishing service, the chem clean is discounted to $100.00. A current instrument appraisal is crucial for recovery from the unfortunate event of loss or theft. The used Martin or Bach you paid $400 for in 1985 might be worth $2500 or more today. Doctor Valve can provide an accurate and complete description in the form of an Instrument Appraisal and Valuation done at the time of servicing your instrument for an additional $50. The rate for a stand-alone instrument appraisal is $60. I know you want you instrument back as soon as possible, and I do my best to accomplish this. Within each service category, I work on horns in the order they arrive in the shop, and complete each task as promptly as fine craftmanship will allow. Standard turnaround time for a valve overhaul is 5 - 8 weeks. Instrument overhauls and full restorations have been running 6-12 weeks, occasionally longer, if parts need to be made or special ordered. With an appointment, an Optimum Port Matching Valve Alignment or a Chem Clean and Polish, or other miscellaneous repairs or customizations can be done same day. Otherwise these services are turned around within 2 weeks. Rates listed above do not include shipping. Shipping charges consist of insured return shipping of your horn, and depending on the services performed, may include shipping to and from the platers. Invoiced shipping charges range from $55 to $80, depending on the services performed. These charges are detailed in their own section of the shipping page. UPS Second day Air and USPS Priority and Express Mail each have a 100% success rate with me for safe horn shipping. Of course, proper packaging is crucial. Please see the main section of the shipping page for step-by-step details on a recommended method of horn packing. If you need an appropriate box and supplies, "The Doctor Valve Safe Shipping Kit" is available here, and includes everything you need to properly package your instrument. Paypal is the #1 online payment service, and the authorized payment processor for Doctor Valve. Make paypal payments from your account to Steve at DoctorValve.com or through this Pay Now button. You can also make a credit card payment WITHOUT having to create a paypal account through this "Pay Now" button. Please select the manufacturer and enter the model type of your horn. When you click the "Pay Now" button, you'll be directed to a secure page at Paypal.